Requires Visual Basic Runtime 6.0. MicroMP3 is free software supported by donations, not advertisements. 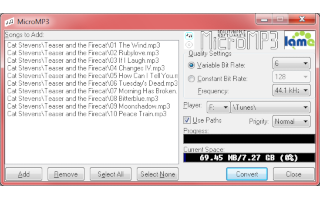 MicroMP3 is a LAME-based compression utility for saving MP3s to low-capacity portable music devices. MicroMP3 uses LAME to compress MP3 files and saves them to a portable device on your computer. It also strips all tags and writes fresh ID3v1 tags for maximum player compatibility, as well as changing file names and directories to basic alphanumerics and underscores. MicroMP3 can compress a batch of MP3s to a selection of variable or constant bitrates, as well as three frequencies. Files may be placed together in a selected folder, or paths may be generated based on Artist and Album ID3 information. An intuitive interface allows you to choose between 0 and 9 VBR, or 32 and 320 kbps CBR, either using the default frequency for the file or forcing it to 32, 44.1, or 48 KHz. Be the first to post a comment about MicroMP3!